Even later on, instead of 28.Bxb7 which immediately simplified into a drawn endgame, Anand could have kept things going with 28.g3 Nc6 29.Bg4! f5 30.f4! when things are far from clear. Admittedly this sequence with Bg4/f4 isn’t the most obvious, but Anand would normally be up to the task. The issue of nerves didn’t come up in this press conference (and he wouldn’t have admitted to it anyway I’m sure). Either way, I did tell my friend GM Josh Friedel that his play in this game reeked of nerves. After getting a small plus in the transition to this endgame, Anand burned up minute after minute on the clock and was way behind by this point. Given the choice of assessing this endgame after 28.g3/29.Bg4/30.f4 or after 28.Bxb7, I’m sure he’d easily see that White is pressing in one and not in the other, but under the pressure of a real World Championship game, he blinked and played 28.Bxb7. While I’ve been wrong on many of the openings, I’ll at least derive some satisfaction in the profiling department from his admission after Game 11 that he wasn’t able to hold his composure well in this match and that cost him in that game as well. Anand played 26…Rdb8 here, which isn’t such a bad move, but there was definitely a viable alternative in 26…Be7. Magnus missed his chance to take this bishop earlier when he should’ve been playing for equality, but now doing so leaves the c4-pawn weak and the d5-outpost can’t be re-established. On the one hand, the a4/b3/c4 pawn chain in the Berlin is great while it restricts Black’s majority, but as soon as Black’s light-squared bishop gets a sniff of activity, the pawns are all weak. 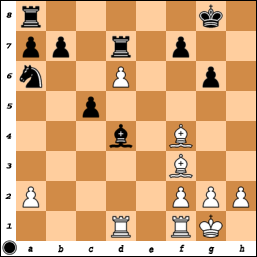 In my one Berlin endgame back in 2002, I got into precisely this predicament against GM Zhang Zhong. There, I happened to break through on the kingside and won a drawn minor piece endgame thanks to a miscalculation from my opponent. So 26…Be7, simply threatening to take on f6 and then on d5 (leaving Black with a clearly better endgame thanks to his better pawn structure and White’s lack of inroads on the kingside) was a good alternative. White should probably play 27.Ne3 and try to hold his pawns together. But 26…Rdb8 wasn’t such a bad move either, if followed up differently. They didn’t seem to talk about 28…Ra3, but the threat against a4 essentially forced 29.Ra1. But then 29…Rxc3! 30.Nxc3 Bxc4 puts White under serious duress. Probably White should still draw this game, but Black’s moves look pretty obvious at this point while White’s optimal defensive setup is not clear. 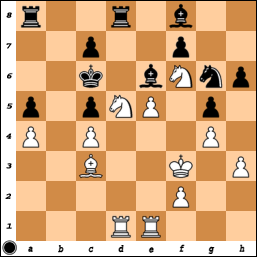 Black activates his dark-squared bishop next with 31…Bg7, and there’s immediately a threat of 32…Nxe5! – the point being that after 33.Kxe5 Re8+ 34.Kf5 Bd3+. 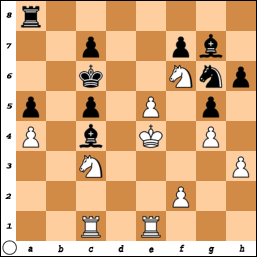 If White’s knight isn’t on c3, then after 35.Re4 Bxe4+ Nxe4, 36…Re5 will be mate. 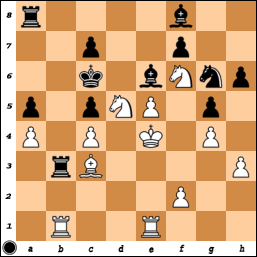 Meanwhile, even if the knight is on c3, then after White interposes with 35.Nce4, Black plays 35…Re6! and despite being down a rook, there’s no escape for White’s king. That actually motivates the weird-looking 31.h4 a bit. The idea is to soften up the g5-pawn so that White’s king has an outlet on that side of the board. Meanwhile, …gxh4 allows the consolidating f4 and …Nxh4 takes the knight offside and releases the pressure on e5. That might even be White’s best option here, and it’s about equal after that point, although Black’s moves again are pretty simple after 31…Bg7. Anyway, after the natural 31.Rac1 Bg7, we reach the above position. The same problems still exist for White here. 32.Ncd5 and 32.Nb5 both allow 32…Nxe5, although after 32.Ncd5 Nxe5 33.Red1, White fights to maintain his knights on d5/f6 for a bit longer. That causes some simplification with the minor piece situation and gets White’s king out of danger. But Black will likely come out with a material advantage of some kind – either two pieces for a rook or an extra pawn with equal rooks. That’d have been interesting to see develop … but after 27…Rb4?, Magnus grabbed the material and ran to the bank without missing a beat. For Anand, the match was definitely an improvement over last year, but it wouldn’t have taken much to pass that debacle. Given how he lost the match (mistakes on the board, but generally caused by weaknesses not on the board), it seems very unlikely he’ll win another World Championship match. Luckily for him, he gets seeded directly into the Candidates, so he will get another crack at qualifying. Qualifying again also seems unlikely, but not facing Magnus and in a tournament setting might still give him a shot if the rest of the field lines up in specific ways. He still knows how to play a little bit. For Magnus, he managed to win without showing his best chess, the typical hallmark for a champion. He started off stronger in Games 1 and 2 than he did last year, but after getting hammered in Game 3, he also lost his way a bit. He’s ambitious and ultra-competitive enough to want to cross 2900 and really dominate the record books, so who knows, he might start utilizing his team more to develop more openings. He gets some time off now to do that as well, since he won’t have to defend until at least late 2016. With Caruana closing in on his rating, Grischuk crossing 2800, and maybe some new challenges from players like Giri, Vachier Lagrave, and So, I’m hoping he can rekindle some of the older (actually younger!) Magnus and raise his chess to new Olympian heights. This entry was posted in World Championship 2014 and tagged Anand, Carlsen, chess, duel of the iron board, World Championship 2014, Wu-Tang Clan. Bookmark the permalink. GM Ian Rogers on chesslife: “Nielsen was former chief second of the Anand team but defected after Anand’s successful title defence against Boris Gelfand in 2012. Nielsen has an intimate knowledge of how Anand prepares for these world title matches – he assisted Anand against Kramnik, Topalov and Gelfand – and his insights should be invaluable for Carlsen.” Carlsen is obviously stronger player and he won. But I believe Nielsen’s defection to Carlsen’s team made the task much tougher for Anand. Vinay, what are your thoughts about Peter Nielsen helping Carlsen after working with Anand from 2002 to 2012 as his chief second? Yeah, that’s an interesting question … I agree that Magnus is the stronger player now, so it might not have changed the result, but I see two main effects. (1) The direct and tangible effect of having been Anand’s chief second means that he knows what lines Anand has looked up through about 2012. I doubt he simply lifted Anand’s theory files and gave them to Magnus, but it’s a tall order to forget everything he worked on and looked at with Anand. So he’ll have some ideas about what might be out there, what to avoid, and where he didn’t feel they were as covered. (2) The other, and more intangible, effect in my view is that it reveals something about Anand’s psychological patterns. For one, Nielsen will know how Anand has prepared for all his previous matches, how he tends to react to certain kinds of surprises, etc. A lot of that can be inferred from his games and how he plays (and Magnus certainly knows him as well), but there’s a difference between suspecting something and actually knowing it. Pretty sure the answer is never. So Anand’s a nice guy for saying “go ahead” (and even letting Nielsen have a test run with Magnus before leaving Anand’s team permanently). Anand plays against the pieces more so than the opponent, which is very much a different approach than Carlsen’s, Nakamura’s, Topalov’s, etc. It’s also different than how Kramnik plays now (as opposed to the early 2000s). But while he isn’t trying to consciously influence his opponents, Anand is a competitive guy too, and he must have understood that Carlsen was a serious threat to his own reign as World Champion. So to delay his own fall, he might have told Nielsen that he’d prefer if he didn’t work with Magnus until he had lost the title himself for example. To me the transfer suggests a bit of fatalism that he not only let Nielsen go (likely a good move in general for Anand just to change things up), but he let him go to Magnus specifically while he’s still playing for titles. kasparov offered to be Gelfand’s second in 2012 WCC but Gelfand declined because Kasparov helped Anand in 2010 WCC. (Ref: Kasparov on Kasparov Part III, 1993-2005. Page #310) In his book Kasparov claimed he only gave Anand few bits of advice by telephone and Gelfand was wrong to turn him down on ethical grounds. There’s also the fact that Kasparov accused Gelfand of lacking moral character after Kasparov’s loss to Kramnik in the 2000 match. Gelfand and Kasparov had done a single training session together in 1998, and by virtue of that, Kasparov said he should have been excluded from working with Kramnik at any point. Pretty much BS in my view.